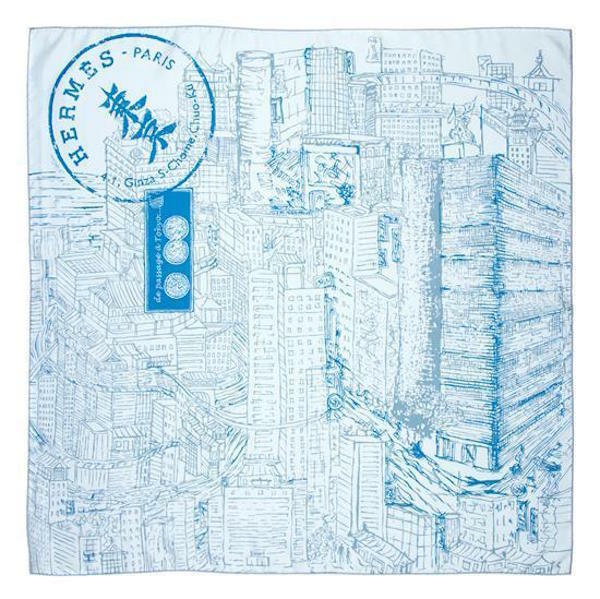 HomeOn The SquareHermès Scarves Online Only! 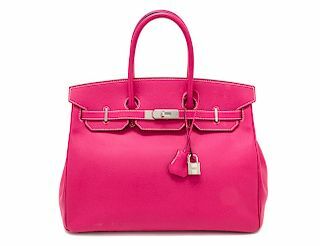 The name Hermès has long been synonymous with the very best in high end luxury items. 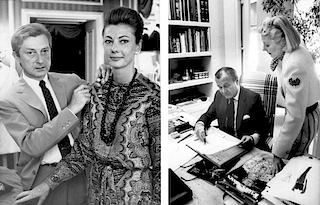 Established in 1837 by Thierry Hermès, the company has progressed from making high-quality wrought harnesses and bridles for the carriage trade, to its current status as a world leading luxury manufacturer specializing in leather, lifestyle accessories, home furnishings, perfumery, jewellery, watches, ready-to-wear, and more. 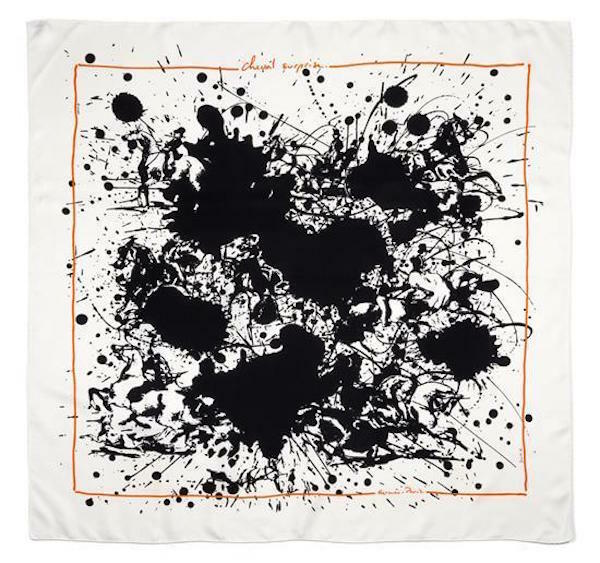 Scarves sit snuggky among the quality goods produced by Hermès, and on Tuesday, June 13 Leslie Hindman Auctioneers offers bidders the chance to grab them by the handful, when they stage their online only Hermès Scarves sale. 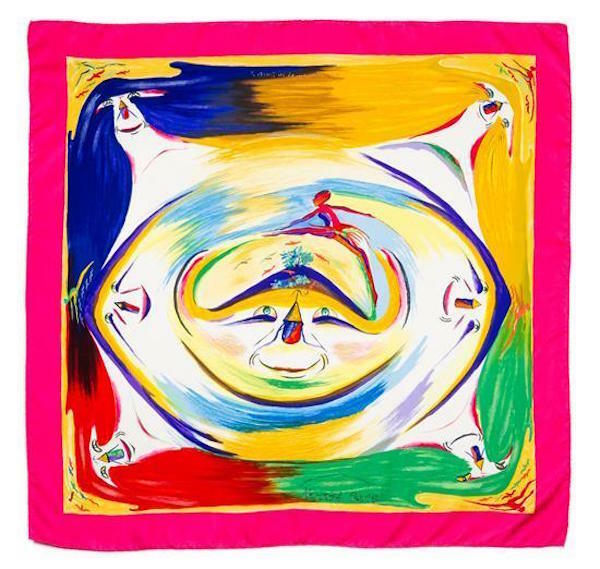 Over 150 items are set to go under the hammer, predominantly in silk, with such a vivid array of colors that all are sure to find a scarf in a design to their liking. 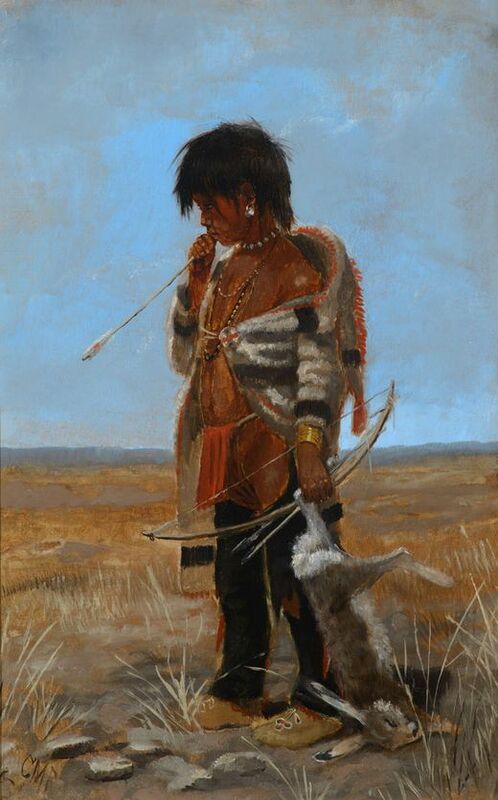 Demand is sure to be strong, so dont be shy! 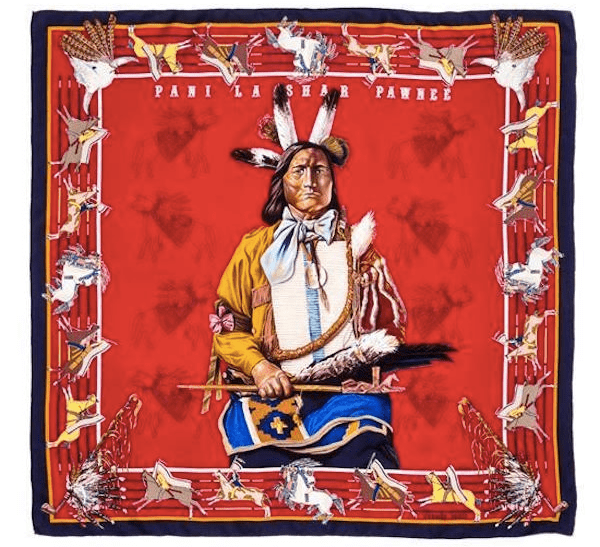 The Wild West is just about the last place youd expect to see an Hermès silk scarf but as motifs go perfect for those with an unflagging flair for the dramatic! 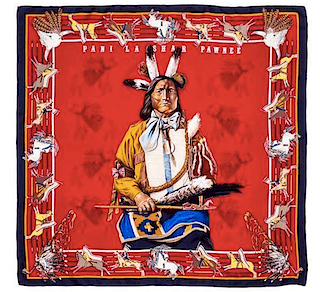 Lot 110, a 90cm silk scarf in a pattern titled Pani la Shar Pawnee, was designed by Kermit Oliver and captures perfectly the noble ancestry of the American Indians. Lot 106 is a real eyecatcher suited to a windy day at Saratoga racecourse - a red and pink pattern titled Puzzle designed by Joachim Metz. 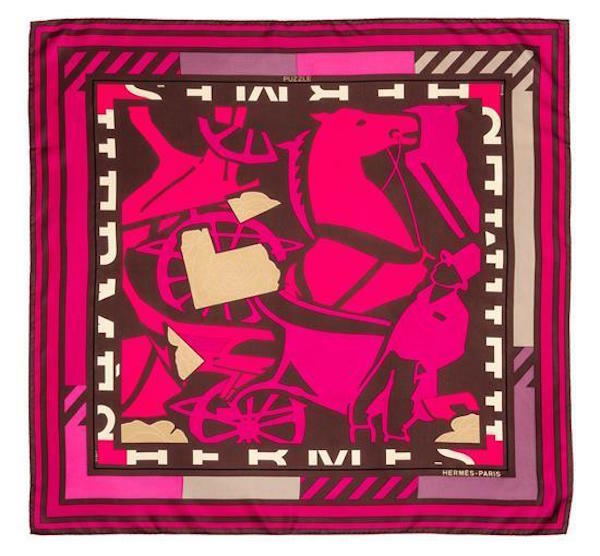 Horses and carriages can be seen within the print, as can the word Hermès, allowing admiring glances to catch the brand name without having it shoved down their throats. Silk scraves have always been a splendid way to inject bold color into an outfit and Lot 107 - titled H en Bias and also designed by Joachim Metz - more than fits the bill. 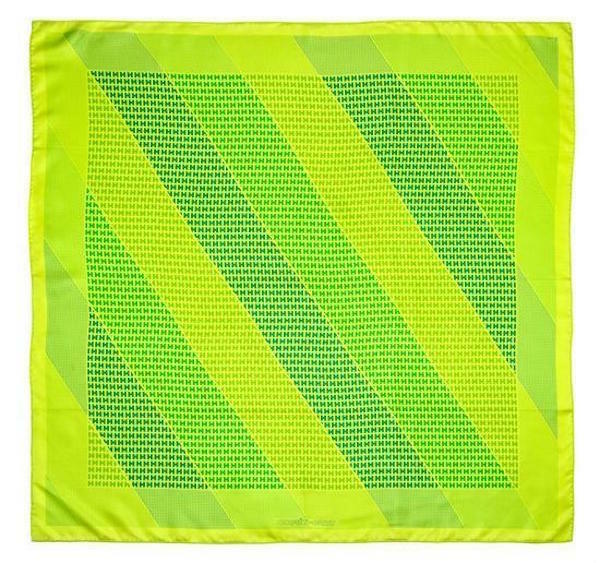 Coming in a vivid array of greens with Hermès labeled within the print, this scarf is as much at home in the garden as it is behind the wheel of an M.G. Lot 140 - titled De Passage a Tokyo, designed by Nathalie Vialars, pays homage to the capital of Japan in all its 21st Century wonder. Vialars manages to capture the stunning intensity of this thriving Oriental metropolis while still injecting the design with an element of romantic longing - no mean feet in a cynical age. 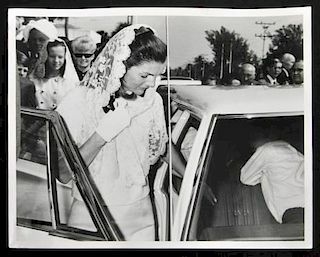 Leslie Hindman Auctioneers, Hermès Scarves sale will be held online only, though items are available for preview in their Chicago office by appointment. 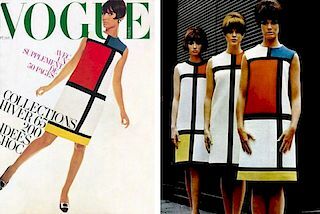 Look now at the full catalog.